How Difficult Is Overbite Correction for Adults? If your top teeth overlap your bottom teeth, you have an overbite and you may want to consider overbite correction.In the field of dentistry, an overbite is determined by how much your teeth overlap or how many of your upper teeth cover your lower teeth. An overbite is a completely normal occurrence. Nearly everybody has one. But, when your overbite is too small or too large, you may encounter problems. One problem is when your overbite is distinct. This results in what orthodontists call a deep bite. This type of bite may cause problems like pain, excessive wear, and aesthetic issues. If you do have a problematic overbite though, not to worry, overbite correction for adults is not difficult with the help of orthodontics. The average overbite is around 2 – 4mm. This is a normal range and both your upper and lower teeth will be aesthetically appealing. If your overbite is smaller, your lower teeth will be more noticeable. When there is a significantly reduced overbite or none at all, it’s referred to as an anterior open bite. With an anterior open bite, there’s usually a gap between your upper and lower teeth when your jaws are closed. Some patients feel that this isn’t very attractive. If your overbite is increased, fewer of your lower teeth will show. In severe cases, this can lead to wear of your lower teeth or even trauma to the gums on the back of your upper central incisors. If you think you have an overbite, a consultation with an orthodontist is the first step. Overbite correction will be key to your treatment. Most overbites are the result of heredity or genetic factors. As our teeth grow when we’re children, they randomly emerge from your gums. They stop growing once they hit the adjacent teeth. It is this randomness that causes overbites and malocclusions, and it’s very common. To make things worse, overbites can be exacerbated by early childhood habits like thumb sucking. Sucking your thumb puts pressure on your upper teeth. In turn, this forces them forward and places pressure on your lower jaw, forcing your jaw backward. As you get older, the overbite that started in childhood becomes pronounced, and may lead you to seek overbite correction for adults. This type of overbite occurs when your teeth aren’t properly aligned. In such cases, your lower jaw may be well balanced with your upper jaw, but the misalignment of your teeth causes your lower jaw to force back towards your neck. Typically, nonsurgical treatments work well for this type of overbite correction for adults. With this type of overbite, your lower jaw is too small to fit your upper jaw. As a result, the upper rows of teeth push forward over your small jaw. Skeletal overbites usually require surgical solutions to realign the jaw. Is It Important to Correct an Overbite? Correcting an overbite may just be a matter of wanting to enhance your appearance and smile. But you need to remember that if an overbite goes uncorrected, it can cause a range of dental and health problems. For instance, overbites make speech difficult. As a result, you might suffer a speech impediment, or you may overcompensate when articulating certain words. An overbite can also make chewing difficult and in severe cases, result in gum damage. This happens when your lower front teeth come into contact with the gum line in the back of your upper front teeth. The upper teeth strike the gum line, resulting in your gums receding. Damaged gums equal tooth loss and gum disease. What’s more, an overbite can result in tooth wear and damage, and even sleep apnoea. Jaw pain is another consequence of an uncorrected overbite. Misaligned jaws can lead to chronic jaw pain and even headaches, contributing to the development of Temporomandibular Joint Disorder (TMD). Typically, a dentist will refer you to an orthodontist for overbite correction. Overbites tend to be easier to treat in children, since a child’s jaw is still developing, however overbite correction for adults is quite common. For teens, overcrowded teeth is the most common problem. But for adults with an overbite, it is the lack of early preventative treatment that leads to more severe symptoms associated with overbites. 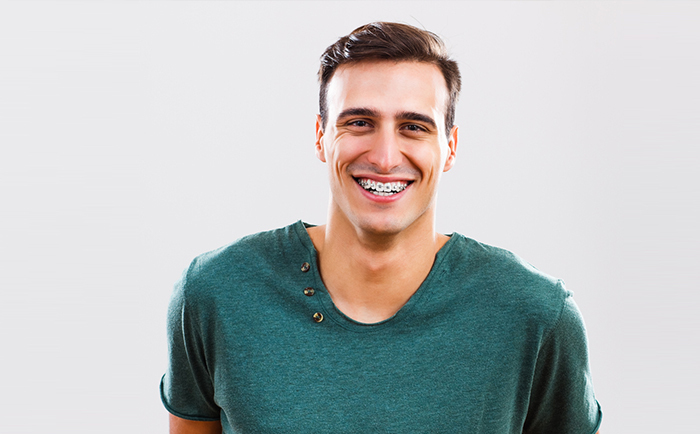 When you seek treatment, your orthodontist will examine the area and create a treatment plan that may last for two or more years depending on the severity of your overbite. Your orthodontist will start with x-rays, to determine what kind of overbite you have and the relationship between your jaw and teeth. From here, they will develop a treatment plan. Braces – braces help move just the teeth that cause the overbite. Surgery– if you have a skeletal type overbite and jaw problems, surgery is the solution. Over time, more options have become available to treat adult overbites. No matter which option you select, it’s always important to seek professional orthodontic advice first. There are several alternatives available for overbite correction for adults. The right one for you will depend on the severity of your overbite, your budget and how long your treatment will take. To find out which overbite correction will work for you, book a consultation at Medland Orthodontics either at our Brisbane clinic or Gold Coast practise today.